Just the opening act of the Bermuda reveals, , contrary to the cards name. 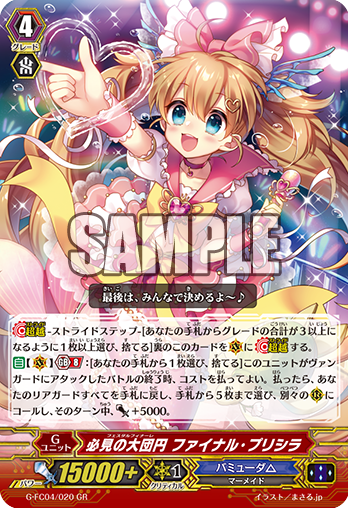 For Today’s Card we’re introducing the 《Bermuda Triangle》 Generation Break 8 G Unit “Festal Finale, Final Priscilla” from the “Fighters Collection 2017” (on sale May 12nd, 2017). “Festal Finale, Final Priscilla” is a G Unit that supports continuous attacks. At the end of a battle in which it attacks a Vanguard, you can discard 1 card from your hand to return all of your allies to your hand. And then you call up to 5 cards from your hand to Rear-guard Circles, and during that turn, the Called Units gain Power+5000! By doing this, you can activate use the specialties of 《Bermuda Triangle》, such as their abilities that activate when they return to the hand, and the clan ability 【♪♪(Harmony)】. And, if you Call “Admired Sparkle, Spica” or “Sparkle in Her Heart, Spica”, you can increase the number of your attacks, and allowing you to buff all of your allies! Since this ability activates after the Drive Check, you can Call the cards added to your hand after the Drive Check. So use your hand effectively to decide the game instantly!